At CPJ Field we are committed to supporting local charities and are continually amazed at the lengths our colleagues go to to help their local communities and nationwide initiatives. At the end of 2016 we appointed 7 Community Champions, colleagues whose role it is to identify good causes and to work alongside them to create fun engaging fundraising events. Below is a round up of all the charity work we did in 2017. In January our Heritage & Sons branch in Aylesbury ran a food drive alongside St Joseph’s parish in Aylesbury. Our colleagues organised for food to be donated to the church and each week they prepared a variety of meals, inviting the local homeless people to come and enjoy some hot food and a conversation. At the same time our Shires branches were taking part in the ‘love heart’ campaign for the British Heart Foundation. This campaign invited people into the branch to write the names of loved ones on hearts, along with a small donation, that were then displayed in the branch windows. In London, our Constable & Toop branches reminisced on our connection with author AA Milne, creating a campaign in celebration of Winnie the Pooh day. 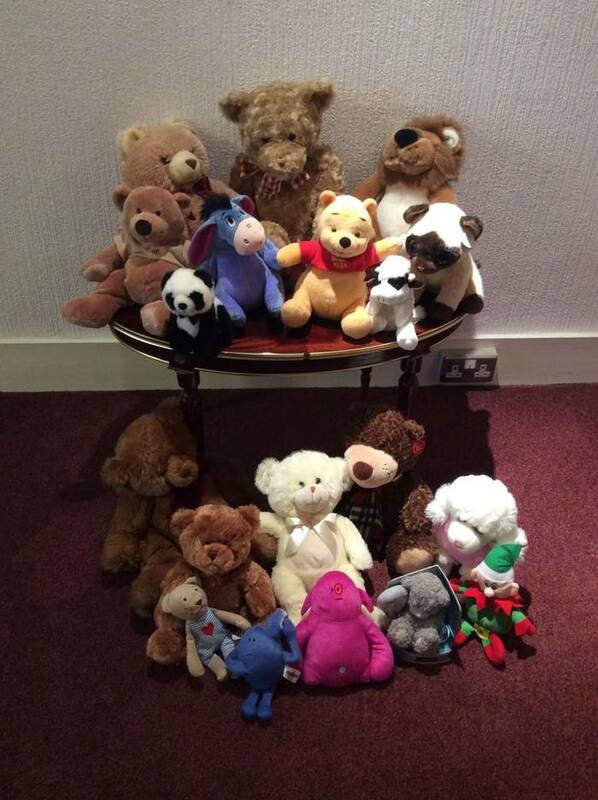 The branches collected over 200 teddy bears which were donated to Demelza Children’s Hospice. In February, our Deric- Scott branch in Bournemouth hosted the first of a series of Knit and Natter groups. 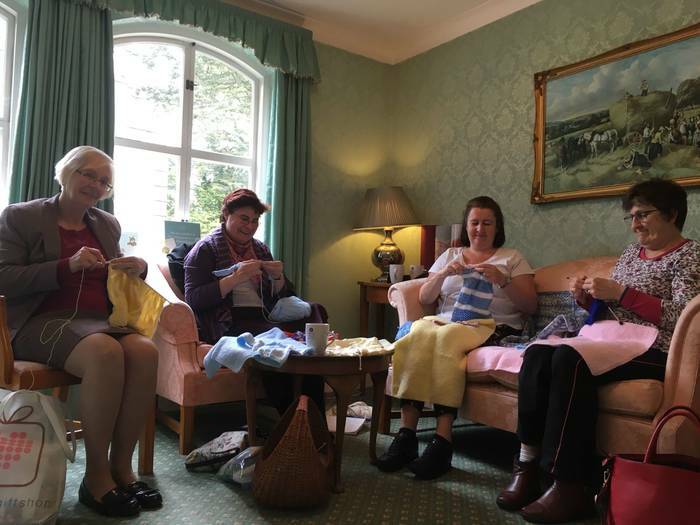 These meetings bring people together to chat whilst knitting shawls for premature babies. Once the groups had a sizeable collection of knitted materials these were donated to BLISS, the premature baby charity. Deric-Scott also joined Shires in starting a book club for bereaved people. These monthly meetings were set up so our colleagues could keep in contact with those we have worked with in a more social setting. In March, Fuller & Scott Uckfield collected donations for two charitable causes. The first event was held on red nose day, our colleagues baked a variety of red treats and opened their doors for a charity coffee morning. Secondly, they set up a stunning Easter window display, asking for donations of chocolate eggs to be donated to local children homes. Fullers were inundated with donations and were also able to donate them to local care homes. 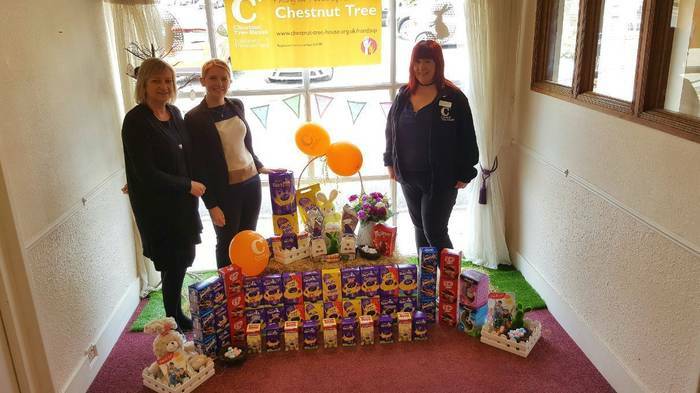 Our Cooper & Son, Constable & Toop and Shires branches also collected Easter eggs for local charities and this continued throughout April. Heritage & Sons in Aylesbury organised a professional flower arranging workshop with local florist Jayne Richards. The event was organised to show the local community some of the work that goes into arranging flowers for funerals. All donations received at the event went to Child Bereavement UK and Florence Nightingale Hospice. Moving onto May, Ballard & Shortall in Forest Row organised a ‘Fires and Spires’ event to support the local fire department and for some vital repair work for the Holy Trinity church. The event held at The Swan pub brought local traders together alongside local bands, to play music for all in attendance. 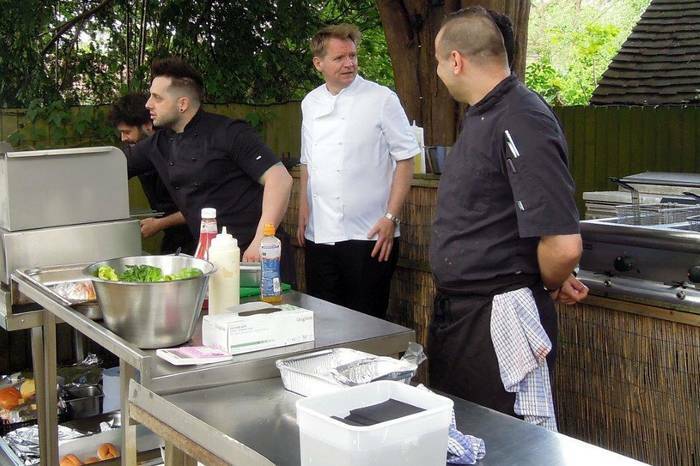 The branch booked a Gordon Ramsey lookalike to come along which proved quite successful and added an extra celebrity dimension to the event. Olympic cyclist Bradley Wiggins also attended to support the local community. Also in May is Dying Matters Awareness Week. Our Lingfield branch held a community coffee morning with the purpose of explaining the choices surrounding end of life planning to those in attendance in a friendly and informal manner. The event was well attended and all donations went to St Catherine’s Hospice. In Crawley our colleagues attended an event organised by Dying Matters to support children who had recently experienced loss or had a terminally ill parent. Our colleagues made individual packets of sweets to be given to children as well as providing a bouncy castle, giving the children something fun to focus on while our colleagues were able to have professional discussions with the rest of the family. Fuller & Scott began to collect Stamps for Kent, Sussex and Surrey Air Ambulance. 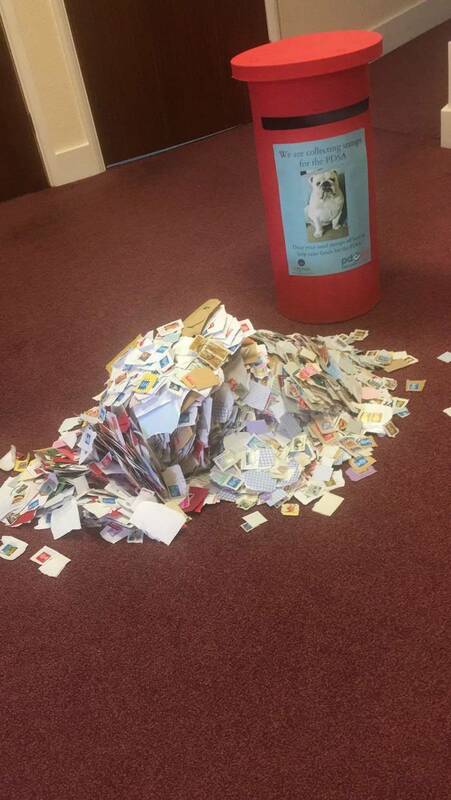 The branch managed to collect £140 worth on stamps for the charity in the first month alone. Constable & Toop, Belvedere also started collecting stamps for the PDSA and were overwhelmed with support after creating posters featuring images of their own pets. In June, we supported the Alzheimer’s Society with their Cupcake day across our business. Various branched held bake sales and coffee mornings to raise awareness and vital funds to combat Alzheimers. Our Cooper & Son branch in Lewes donated a trestle table to St Thomas A Beckett church. The donation was very much appreciated by the churches priest and congregation and the story was featured in the Brighton Argus. 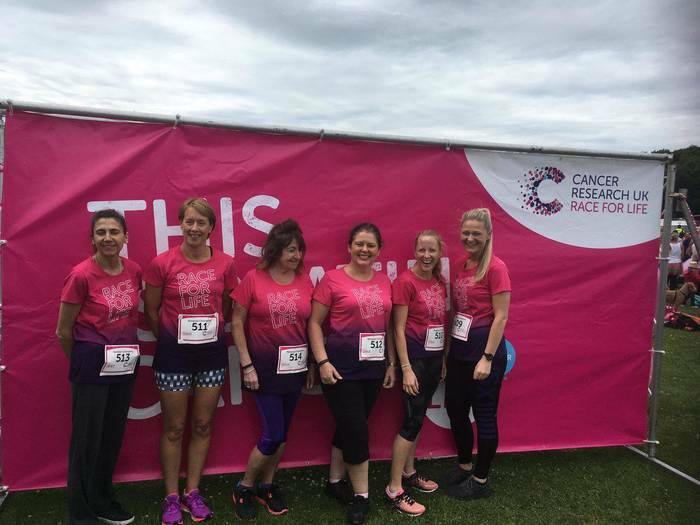 In July, colleagues from Rampion House ran a 5K race for life event in Brighton. The team of six runners managed to raise a fantastic £665 for Cancer Research UK. The event held in Stanmer Brighton was run by over 2,000 women and our colleague Marie Carey finished in 2nd place. Also in July all our Shires branches came together to host six different Blooming Great Tea Parties for Marie Curie. These events were all highly successful and our Bedford event was even attended by the mayor. 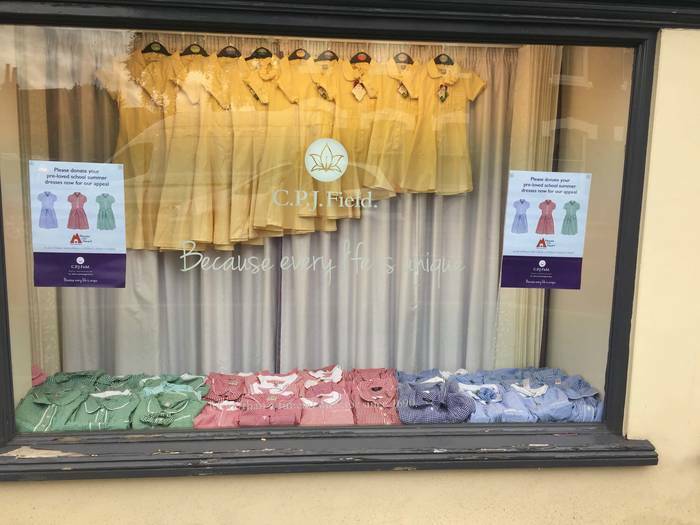 Shires continued the excellent fundraising well into August when they worked with Heritage & Sons to collect used school dresses for children in Nepal. 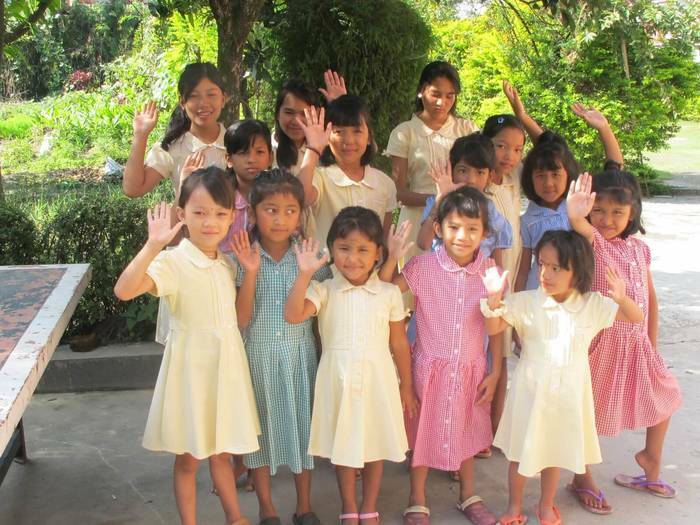 Together our branches managed to collect 100 dresses for the House with a Heart campaign and received some wonderful letters and photos back from the girls across the globe, as well as press coverage in the newspaper and on local radio. Ballard & Shortall hosted a 5-a-side football tournament in East Grinstead for Bobby Moore Fund. 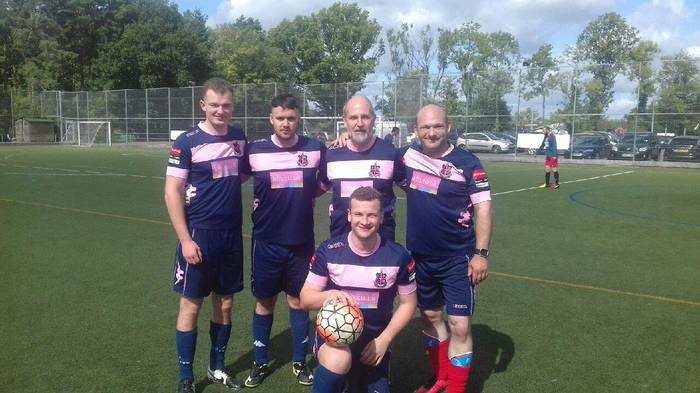 A team of CPJ Field colleagues took part and had their kit donated by non-league side Dulwich Hamlet FC. It was a fun and competitive day that was well organised by all involved. Ballard & Shortall didn’t stop there, working on a Stars in Their Eyes concert which raised £500 for the Alzheimer’s Society and Band of Brothers, Crawley. Heritage & Sons joined forces with Horsewyse in Aylesbury to host an equine themed event. CPJ Field colleague Becky Greenaway-Ewers offered pony rides on her horse Eileen and together the day raised a total of £1300. 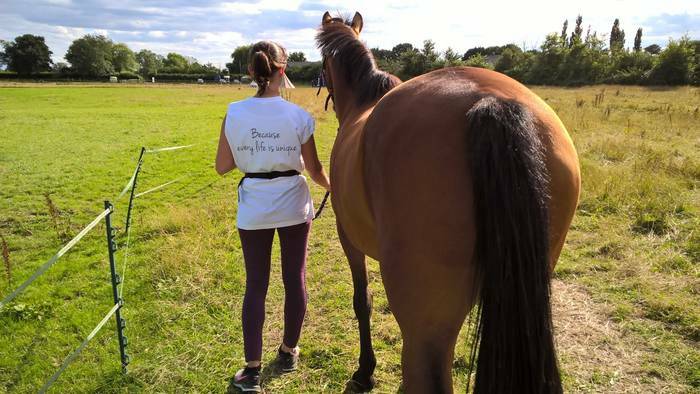 Horsewyse is a charity that helps provide horse riding lessons and horse caring lessons to children with learning disabilities. The Sussex Hospices Trail walk launched in September. CPJ Field was involved with the walk from inception, working closely with the charity to organise the 200-mile walk. 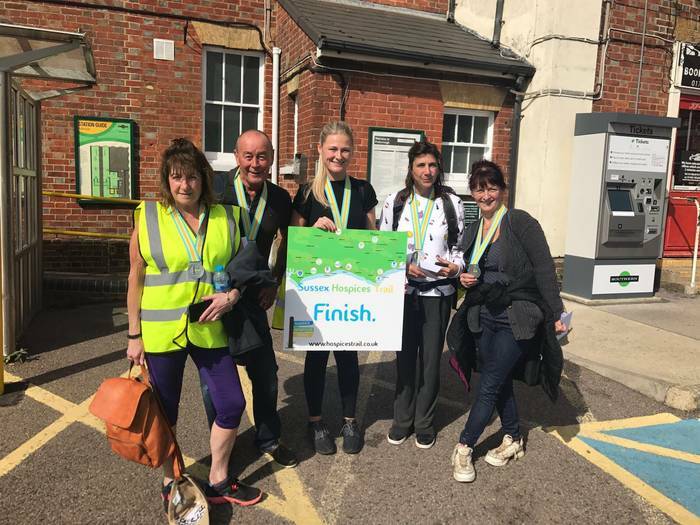 Four CPJ colleagues took on part of the challenge, walking 9 miles between Billingshurst and Pullborough. All of our branches took part in the Macmillan Worlds Biggest coffee morning. Colleagues baked cakes, organised raffles and made a record number of coffees for all who got involved. Together we managed to raise a total of £893 for the UK based charity. Pink Day took over our Rampion House office in October as the team pulled together to raise funds for Breast Cancer now. The office was decorated with pink bunting, there was a pink bake sale and a pink raffle. The team looked vibrant indeed in their pink inspired fancy dress. Ballard & Shortall, Lingfield organised for keen local knitters to donate items of clothing for premature babies. 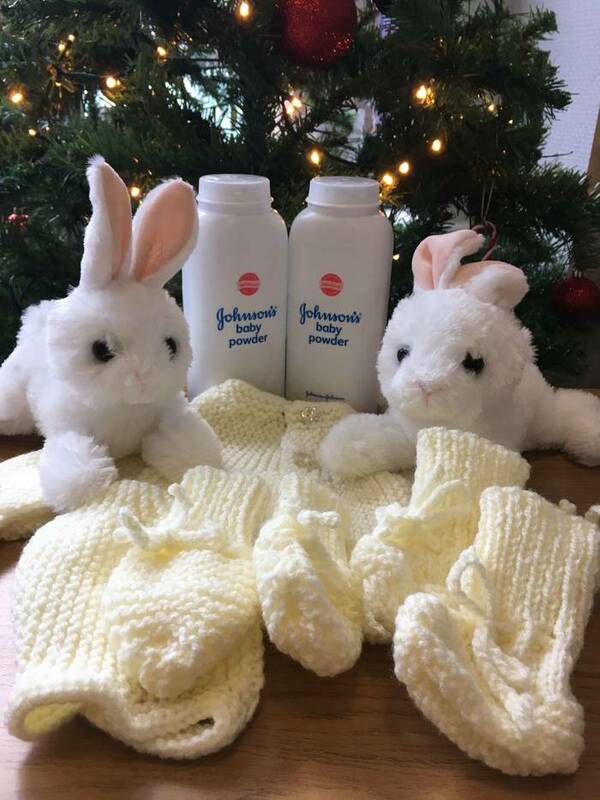 The branch handed out free wool and patters and once they had collected a large amount of items they donated them to the neonatal unit at their local hospital. In November, our team from Edmund & Sons visited Helmi House care home and treated the residents to a War Time quiz, tying in with Remembrance Day. Our team spent the afternoon entertaining the care home residents with 1940’s music, games and plenty of cake. In December we hosted a variety of Christmas memorial events. More information about these can be found here. This year we have helped a variety of notable causes and made a difference at every opportunity presented to us. We are delighted so many of our colleagues have got so actively involved with all these great causes and we thank them profusely. We look forward to supporting more local charities in 2018.